Before Ravi Shastri and after Garry Sobers, Mike Procter had clobbered six consecutive sixes in First-Class cricket. Mike Procter clobbered Dennis Breakwell for six consecutive sixes on August 27, 1979, at Taunton. Abhishek Mukherjee looks at the second occurrence of an event that has happened only thrice in the history of First-Class cricket. The fact that the Test world did not get as much of Mike Procter as it should have is a terrible loss. Procter played only seven Tests, in which he had picked up 41 wickets at 15.02 with a strike rate of 36.9, he was peaking at the turn of the decade (he had been nominated a Wisden Cricketer of the Year in 1970 thanks to his 103-wicket season for Gloucestershire in 1969) but his Test career vanished into oblivion at an age of 24 thanks to his Government’s policies. Though he started his career mainly as a menacing fast bowler, who famously “bowled off the wrong foot”, Procter’s batting scaled new heights in the 1970s: on his day he could tear any bowling apart with his ability to hit big and clean and accelerate at an alarming rate. An even worse bit of information for the bowlers was the fact that not only could he blast them, he now took things to the new level by scoring big. 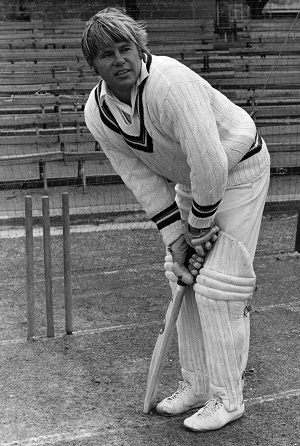 By 1970 he had already emulated CB Fry and Don Bradman by scoring six consecutive First-Class hundreds. This included a surreal innings of 254 (his career-best) out of a team total of 383 against Rhodesia at Salisbury. Amidst all this he made a mockery of Ashley Mallett when the touring Australians played Western Provinces, taking him for 5 sixes in a single over. For once Garry Sobers’s record of six sixes was threatened: playing for Nottinghamshire against Glamorgan the great man had hit six sixes off a Malcolm Nash over in 1968. Procter had challenged the great man’s feat but had fallen one six short. As the 1979 Championship approached its final stages Gloucestershire headed for Taunton to take on Somerset. Being one of the flatter tracks and smaller grounds, the County Ground at Taunton was often a nightmare for bowlers — especially the spinners — as more often than not a pair of powerful shoulders or forearms sent the ball soaring into the stands, or sometimes even over it — and if really hard, into the adjacent River Tone. It helped Somerset that they had Ian Botham and Viv Richards in their ranks — men who could biff the ball seriously hard — hard enough to intimidate any bowling line-up into submission. Up against them were the classical Zaheer Abbas, the busy Sadiq Mohammad, and the brutal Procter, who was by now leading Gloucestershire. Procter had already massacred Northamptonshire earlier that season: playing them at Bristol he had scored a 57-minute hundred, eventually scoring 122 out of 167 during his stay at the wicket. The hundred would eventually win him the Walter Lawrence Trophy. A week before the Taunton match he had scored 50 not out and 102 — both at breakneck pace — against Surrey at Cheltenham. Brian Rose, that colourful Somerset captain, won the toss and elected to bat after the first day’s play was called off due to rain. Three quick wickets from Brian Brain and David Partridge left the hosts reeling at 40 for 4. Botham scored a quick 30, but eventually it was left to Peter Denning and Vic Marks to lead a resurrection of sorts. The duo batted at a brisk pace and accelerated, with Marks dominating the partnership and Denning playing a support act. They eventually departed in quick succession, and Rose declared the innings closed as soon as his side reached 200 for 7 and had achieved the crucial bonus point. Hallam Moseley and Botham then struck back, removing Zaheer and Chris Broad in quick succession after Sadiq had to retire hurt. The tourists were now 28 for 2 (effectively for 3), and virtually in the same position Somerset was in earlier in the day. Procter walked out to join the opener Andy Stovold. He had two options: to defend his way out of the situation, acquire a lead of sorts and kill the match; alternatively, he could counterattack, tempt Somerset into a declaration, and chance his arms to pull off a win. He chose the second one. It was probably the most exciting 46 minutes of Stovold’s career: Procter played one of the most exhilarating innings Taunton had witnessed. Rose continued with Moseley and Botham for a while before summoning Dennis Breakwell. The poor left-arm spinner had no idea what was in store for him. Breakwell’s first over was largely eventless, as were the first four balls of his next over. The fifth and sixth, however, disappeared into the stands of Taunton. Two sixes, everyone thought: it was not anything that unusual at Taunton. Maybe Breakwell will get another chance. Sanity prevailed at the other end as Botham bowled a maiden to Stovold. It was as if the events at the two ends of the pitch were on two different grounds — or maybe in two different matches. Rose took the gamble. He gave Breakwell another over. The first ball soared high over the Taunton stands towards St James’ Churchyard. Three in three. Rose had possibly still not regretted his decision. Maybe he had thought that Procter could have been lured into a trap. The hopes received a jolt as the next ball landed in the car-park. Four in four. Breakwell wasn’t new to the situation: five years back he was clobbered for four consecutive sixes by — in a quirky twist of fate — Malcolm Nash. Procter stood calmly. Four was nothing to him — he had already hit Mallett 5-in-5 once. The next one soared high, landing on top of the ground toilets. Five in five — for a second time in his career. A buzz spread around the ground now. The other person who had come the closest to hitting 6 sixes in an over had been Frank Hayes of Lancashire — also against Glamorgan, also at Swansea, and more miraculously, also off Malcolm Nash — who had managed 34 (6, 4, 6, 6, 6, 6). The Gloucestershire players stood at their dressing-room window, hoping to catch a bit of history. Breakwell (poor guy, Procter made him live up to his surname that day) tried his best to remain composed: he possibly expected some kind of divine intervention to happen, something that would result in the Earth move apart and consume the demon at the other end. Something. Something. Nothing happened. There was no justice for Dennis Breakwell. There was a rush in the Gloucestershire dressing-room as the ball found the open window high, high up in the stands — and flew inside. Six sixes off six balls! Sobers was equalled! The ground erupted in ecstasy. Procter bludgeoned his way his way to a 46-minute 93 before he dragged one on to the stumps in an effort to heave Botham out of Somerset. The 93 had come out of a partnership of 107, Stovold being only too happy to pass the strike on to his captain. “The buccaneering South African all-rounder deposited his sixes to the distant corners of the ground,” wrote Daily Mail. Procter’s blitz had included 3 singles, 3 twos, 9 fours, and 8 sixes. Stovold’s calmness came to an end shortly afterwards, and Procter, just like Rose, declared the Gloucestershire innings closed at 200 for 6 — with just enough time for Somerset to face Brain and himself before stumps. The stage was set for Richards to give it back to Procter, but it was too good to be true. Instead, Rose himself added 245 in an opening stand with Phil Slocombe before the captain fell for 133. Richards fell early, and the declaration came at 263 for 2 as soon as Slocombe brought up his hundred. The rest of the match belonged to Zaheer. After the openers (Sadiq had recovered by now) had gone with 45 on the board, Zaheer produced an innings of the highest class, adding 114 with Broad for the third wicket — the latter contributing only 21. There was a slump as the tourists were reduced to 179 for 5, but Zaheer added another 47 for the sixth wicket with Mike Garnham. When Zaheer eventually fell to Marks the visitors required another 38 with 4 wickets in hand, but they lost 2 more wickets quickly. When David Graveney walked out to join Garnham Gloucestershire still required 28. However, play was called off with the tourists on 246 for 8, still 18 runs short. In between all that Zaheer managed to take 30 runs (4 sixes, 1 four, 1 two) off an over from – yes, you’ve guessed it right – Breakwell. – There was no stopping Procter: in his next match, against Warwickshire at Bristol, he scored 92 in 35 minutes and 45 balls with 10 fours and three sixes (after scoring a commonplace 96 in the first innings). He was particularly harsh on off-spinner Christopher Clifford, who ended up with figures of 39-7-185-2, but made up for it by catching a Procter blinder one-handed at mid-wicket. – Five-and-a-half years after the carnage Ravi Shastri became the third player to hit six consecutive sixes — against Baroda at Bombay, all off a single over from Tilak Raj. Somerset 200 for 7 decl. (Vic Marks 65, Peter Denning 42; Brian Brain 5 for 61) and 263 for 2 decl. (Brian Rose 133, Phil Slocombe 103*) drew with Gloucestershire 200 for 6 decl. (Mike Procter 93) and 246 for 8 (Zaheer Abbas 147; Vic Marks 3 for 70).